Mathematics (041) CBSE Question Papers 2015-2016, Complete Question Papers of Mathematics (041) CBSE. Home » E-Books » NCERT » Class 12 » Mathematics (041) CBSE Question Papers 2015-2016, Complete Question Papers of Mathematics (041) CBSE. Sample Paper of Mathematics 2014 for class 12, CBSE. 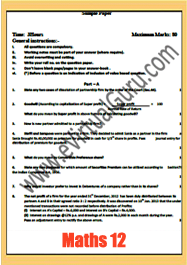 Paper No.1, PDF Sample Paper of Mathematics “( Board Mock Test) – 2010″for class 12, CBSE. Paper No.2, PDF Chemistry (044) Class 12, CBSE Question Papers 2013-2016, Complete Question Papers of Chemistry (044) Class 12 CBSE English (001) Class 12, CBSE Question Papers 2015-2016, Complete Question Papers of English (001) Class 12 CBSE Political Science (028) CBSE Question Papers 2015-2016, Complete Question Papers of Political Science (028) CBSE. «Informatics Practices (065) CBSE Question Papers 2015-2016, Complete Question Papers of Informatics Practices (065) CBSE.